This guide provides instructions for configuring and managing authentication on Red Hat CloudForms. Authentication with CloudForms can be configured using the local database, or authentication systems such as Red Hat Identity Management (IdM), Red Hat Single Sign-On (SSO), Active Directory (AD), or AWS Identity and Access Management (IAM), through protocols such as LDAP and SAML. If you have a suggestion for improving this guide or have found an error, please submit a Bugzilla report at http://bugzilla.redhat.com against Red Hat CloudForms Management Engine for the Documentation component. Please provide specific details, such as the section number, guide name, and CloudForms version so we can easily locate the content. Red Hat CloudForms provides several methods to authenticate users. Authentication can be configured from CloudForms using the local database, or CloudForms can use protocols such as LDAP and SAML to connect to a pre-configured authentication system such as Red Hat Identity Management (IdM), Red Hat Single Sign-On (SSO), Active Directory (AD), or AWS Identity and Access Management (IAM) to use existing user accounts and groups. This guide provides instructions to configure authentication management in your CloudForms environment as an administrative user. After completing the setup of an authentication system, users can log in with their credentials. For further information on managing users, groups, and account roles, see Access Control in General Configuration. As the admin user, configure your authentication method from the Authentication tab in the Configuration menu. Select your server in the Settings accordion. Use Session Timeout to set the period of inactivity before a user is logged out of the console. To configure authentication locally using the Virtual Management Database (VMDB), choose Database. This is the default method. See Creating a User in General Configuration to create users from CloudForms. To configure LDAP-based authentication to use with IdM or Active Directory, choose LDAP or LDAPS, see Chapter 2, Configuring LDAP Authentication with IdM and Active Directory for configuration steps. To configure Amazon AWS Identity and Access Management (IAM) authentication, choose Amazon, see Chapter 3, Configuring AWS Identity and Access Management (IAM) Authentication for configuration steps. To configure federated authentication to use with IdM or Red Hat Single Sign-On (SSO), choose External (httpd) and follow the steps for your authentication method in Chapter 4, Configuring Identity Management (External Authentication) with CloudForms. Select LDAP or LDAPS to configure CloudForms authentication using Red Hat Identity Management (IdM), Active Directory, or another identity management service that uses LDAP protocol. If you choose LDAP or LDAPS as your authentication mode, the required parameters are exposed under LDAP Settings. Be sure to validate your settings before saving them. This procedure requires a preconfigured authentication system such as Red Hat Identity Management (IdM) or Active Directory (AD) with user groups configured. LDAP authentication for CloudForms requires group membership to be defined by the LDAP RFC 2307 schema, where group members are listed by name in the member UID attribute. For more information about Red Hat Identity Management, see the Linux Domain Identity, Authentication, and Policy Guide and related Red Hat Enterprise Linux documentation. Select a Session Timeout to set the period of inactivity before a user is logged out of the console. Select LDAP or LDAPS from the Mode list. This exposes additional required parameters under LDAP Settings. Use LDAP Host Names to specify the fully qualified domain names of your directory servers. CloudForms will search each host name in order until it finds one that authenticates the user. Note, CloudForms supports using a maximum of three possible LDAP Host Names. Use LDAP Port to specify the port for your directory server. The default is 389 for LDAP and 636 for LDAPS. Email Address: Logs in with the user’s email address. SAM Account Name: User logon for Active Directory clients and servers using legacy Windows versions. You must also configure the Domain Prefix in the next field when selecting this option. Specify the Domain Prefix if you are configuring an Active Directory LDAP host, and selected SAM Account Name as the User Type. This field represents the prefix name in the Active Directory domain. Together with the SAM account name, this constructs the fully qualified user name in the format <domain_prefix>\<user>. Specify the User Suffix, such as acme.com for User Principal Name or cn=users,dc=acme,dc=com for Distinguished Name, in Base DN. Configure your Role Settings: In both LDAP and LDAPS, you can use groups from your directory service to set the role for the authenticated LDAP user. The LDAP user must be assigned one of the account role groups. See Section 2.3, “Assigning CloudForms Account Roles Using LDAP Groups” for more information. Select a CloudForms group from the Default Group for Users list. This default group can be used for all LDAP users who use LDAP for authentication only. Do not select Get User Groups from LDAP, which will hide the Default Group for Users option. Select Get User Groups from LDAP to retrieve the user’s group membership from LDAP. This looks up all groups in the directory server for the user attempting to log in. This group list is matched against the available groups configured in CloudForms. Once a match is found, the role associated with the matching group identifies the authority the user will have on CloudForms. This requires group names on the directory server to match CloudForms group names. Selecting this box enables user records to be automatically created in CloudForms when a user logs in. If you do not select Get User Groups from LDAP, the user must be defined in the VMDB where the User ID is the same as the user’s name in your directory service typed in lowercase. See Creating a User in General Configuration for steps on creating users. Select Get Groups from Home Forest to use the LDAP groups from the LDAP user’s home forest. This will allow you to discover groups on your directory server and create CloudForms groups based on your directory server’s group names. Any user logging in will be assigned to that group. This option is only displayed when Get User Groups from LDAP is selected. In most environments, it is recommended to select both the Get User Groups from LDAP and Get Groups from Home Forest options. Select Follow Referrals to look up and bind a user that exists in a domain other than the one configured in the LDAP authentication settings. Specify the user name to bind to the directory server in Bind DN. This user must have read access to all users and groups that will be used for CloudForms authentication and role assignment, for example, a service account user with access to all LDAP users (named svc-ldap in this example). Enter the password for the Bind DN user in Bind Password. Click Validate to verify your settings. LDAP authentication is now configured in your CloudForms environment. To assign account roles using LDAP groups, see Section 2.3, “Assigning CloudForms Account Roles Using LDAP Groups”. Optionally, if a user has group memberships in another LDAP forest, specify the settings to access the memberships in the trusted forest. When trusted forests are added to the authentication configuration, they are used only for finding groups that a user is a member of. CloudForms will first collect all of the user’s groups from the primary LDAP directory. Then it will collect any additional groups that the user is a member of from all of the configured forests. The collected LDAP groups are used to match, by name, against the groups defined in CloudForms. The user must be a member of at least one matching LDAP group to be successfully authenticated. Select Get User Groups from LDAP, and enter all items in the Role Settings area. In the Trusted Forest Settings area, click (Click to add a new forest). Enter the LDAP Host Name, select a Mode, and enter an LDAP Port, Base DN, Bind DN, and Bind Password. After adding other trusted LDAP forests, you can then change the order in which CloudForms looks up the forests for authentication. For instructions, see Section 2.4, “Configuring Lookup Priority for LDAP Groups”. After configuring LDAP authentication as described in Chapter 2, Configuring LDAP Authentication with IdM and Active Directory, you can associate CloudForms account roles with your LDAP users. The LDAP directory server defines the groups and users for CloudForms, while CloudForms defines the account roles, and maps the roles to the privileges the LDAP user has. Create groups on your directory server based on the default account roles in CloudForms. The users in your LDAP groups then inherit the CloudForms account roles for the LDAP group(s) they are in. LDAPuser1 attempts to log into CloudForms, so CloudForms queries the directory server to verify it knows LDAPuser1. The directory server then confirms that it knows LDAPuser1, and provides information about the LDAP groups LDAPuser1 belongs to: Group1. CloudForms then looks up Group1, and discovers that Group1 is associated with Role1. CloudForms then associates LDAPuser1 with Group1 in CloudForms, and then allows the user to perform tasks allowable by that role. This section provides instructions for mapping your existing LDAP groups to account roles in CloudForms. As a result, the users in the LDAP group will then be assigned to the CloudForms roles associated with that group. Click the Access Control accordion, then click Groups. Click (Configuration), and (Add a new Group) to create a group. In the Description field, enter the common name (cn) for your existing LDAP group assigned to users requiring access to CloudForms. Select Look Up LDAP Groups to find a list of groups assigned to a specific user in LDAP, then use the LDAP Group for User list to choose a group. In User to Look Up, enter the common name (cn) for a user in your LDAP group. In Password, enter the user’s password. Click Retrieve. Select a Role to map to the group. Select a Project/Tenant to map to the group. In the My Company Tags tab, select tags to limit the user to items containing those tags. The items that have changed show in a blue italicized font. In the Host & Clusters tab, select the host and clusters to limit the user to. The items that have changed show in a blue italicized font. In the VMs & Templates tab, select the folders created in your virtual infrastructure to limit the user to. The items that have changed show in a blue italicized font. To configure the LDAP group lookup priority, see Section 2.4, “Configuring Lookup Priority for LDAP Groups”. You can also configure access control for LDAP users by creating groups on your directory server based on CloudForms user account roles. Your LDAP group names must match the account role names in CloudForms. The LDAP users in that group are then automatically assigned to that specific account role. Define a distribution group for one or more of the account roles with the names shown in the table below. This group must be in the LDAP directory source you specified for the server. See Chapter 2, Configuring LDAP Authentication with IdM and Active Directory. Assign each user of your directory service that you want to have access to CloudForms membership to one of these groups. Click the Settings accordion, then select your server under Zones. Click the Authentication tab and enable Get User Groups from LDAP after typing in all of the required LDAP authentication settings. See Chapter 2, Configuring LDAP Authentication with IdM and Active Directory. CloudForms can have multiple LDAP groups configured, which the appliance will attempt to authenticate with one by one until it succeeds. The lookup priority of these groups can be rearranged. On initial login, a user’s current group assignment is the highest priority group. User group membership, on subsequent logins, is set as the last assigned group from the prior session. Click on the Access Control accordion, then click Groups. Click (Configuration), and (Edit Sequence of User Groups for LDAP Look Up) to prioritize which group a user will default to if LDAP returns multiple matching groups. Select one or more consecutive groups and use the arrow buttons to move the user group higher or lower in priority. Log out of the CloudForms user interface. Log back in as an LDAP user that is assigned to one or more of the matching groups. Change groups by clicking on the user dropdown menu on the top right of the user interface. The dropdown list will show the groups the user is authorized for. 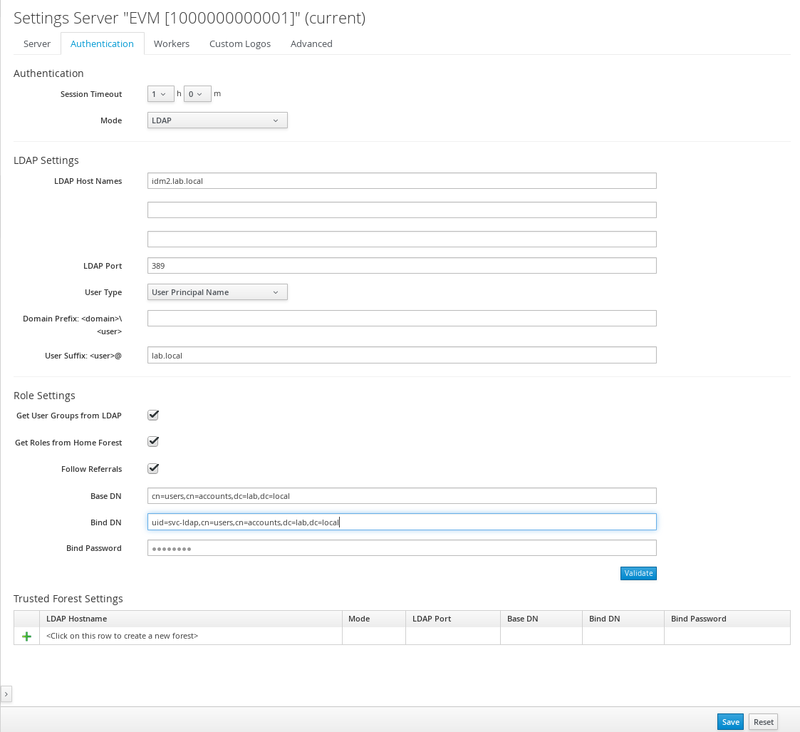 Log into the CloudForms user interface as an LDAP user, while checking /var/www/miq/vmdb/log/audit.log for updated status, success, or failure messages. Alternatively, you can test your LDAP configuration by viewing the logs in /var/www/miq/vmdb/log/evm.log with grep, which are more verbose. If you choose Amazon AWS Identity and Access Management (IAM) as your authentication mode, required parameters are exposed under Amazon Primary AWS Account Settings for IAM (Identity and Access Management). Be sure to validate your settings before saving them. For further information on AWS Identity and Access Management settings, see the AWS documentation. Select Amazon as the authentication method in the Mode list. Type in an Access Key provided by your Amazon account. Type in a Secret Key provided by your Amazon account. Optionally, select Get User Groups from Amazon to retrieve the user’s group membership from Amazon. This is used for mapping a user’s authorization to a CloudForms role. Users logging into CloudForms with Amazon authentication enter their own IAM access key as the username and IAM secret access key as the password. Amazon users must be added as a CloudForms user or belong to an IAM user group added to the list of CloudForms groups. You can configure CloudForms to use system authentication methods such as Red Hat Identity Management (IdM) or IPA, Red Hat Single Sign-On (SSO), or Active Directory (AD). This method uses apache (httpd) modules with web browsers to control authentication to CloudForms. It is the recommended authentication method to connect CloudForms with most identity management services. You can configure CloudForms to use IPA with the External Authentication (httpd) option in CloudForms. When external authentication is enabled, users can log in to the CloudForms appliance using their IPA server credentials. The appliance creates user accounts automatically and imports relevant information from the IPA server. The appliance contains IPA client software for connecting to IPA servers, but it is not configured by default. External authentication is enabled by configuring it with the appliance console and enabling it the web interface. Disabling external authentication and returning to internal database authentication also requires steps in both the appliance console and the web user interface. For an appliance to leverage an IPA server on the network, both the appliance and the IPA server must have their clocks synchronized or Kerberos and LDAP authentication fail. The IPA server must be known by DNS and accessible by name. If DNS is not configured accordingly, the hosts files need to be updated to reflect both IPA server and the appliance on both virtual machines. For users to log in to the appliance using IPA server credentials, they must be members of at least one group on the IPA server which is also defined in the appliance. Navigate to the settings menu, then Configuration → Access Control → Groups to administer groups. To configure the appliance for external authentication, set up authentication using the appliance console, then select the External Authentication option in the web user interface. Log in to the appliance console using the user name admin. Select Configure External Authentication (httpd). Enter the fully qualified host name of the IPA server, for example ipaserver.test.company.com. Enter the IPA server domain, for example test.company.com. Enter the IPA server realm, for example TEST.COMPANY.COM. Enter the IPA server principal, for example admin. Enter the password of the IPA server principal. Log in to the web user interface as an administrative user. Navigate to the settings menu, then Configuration → Settings → Zone → Server → NTP Servers or use the hosting provider of the virtual machine to synchronize the appliance’s time with an NTP server. Select a Session Timeout if required. Select External (httpd) in the Mode list. Select Enable Single Sign-On to allow single sign-on using Kerberos tickets from client machines that authenticate to the same IPA server as the appliance. In the Role Settings area, select Get User Groups from External Authentication (https). To revert to internal database authentication, first configure authentication using the web user interface, then using the appliance console. Select Database in the Mode list. Select Configure External Authentication (httpd). The currently configured IPA server host name and domain are displayed. Enter y to remove configuration details for the IPA client. In addition to using the appliance console, external authentication can optionally be configured and reverted using the appliance console command line interface. Updates the host name of the appliance. If you performed this step using the console and made the necessary updates made to /etc/hosts if DNS is not properly configured, you can omit the --host option. If omitted, the iparealm is based on the domain name of the ipaserver. If omitted, defaults to admin. This procedure outlines how to configure CloudForms to authenticate against an existing Active Directory (AD) configuration using external HTTP authentication. This provides Active Directory users access to the CloudForms appliance user interface, as well as the REST API. Connect to the CloudForms appliance using SSH. Complete authentication setup by configuring the following on each appliance with the user_interface or web_services server roles enabled. Log in to the user interface as an administrative user. Navigate to the settings menu, then Configuration → Authentication. Select External (httpd) as the authentication Mode. Select Enable Single Sign-On to allow single sign-on using Kerberos tickets from client machines that authenticate to the same Active Directory domain as the appliance. In the Role Settings area, select Get User Groups from External Authentication (httpd). Make sure the user’s Active Directory groups for the appliance are created and appropriate roles assigned to those groups. See Roles in General Configuration for more information. CloudForms is now configured to use authentication from your Active Directory domain. This section provides instructions for mapping your existing Active Directory (AD) groups to user account roles in CloudForms. This is done by assigning a CloudForms role to an AD group. When an AD user who is a part of that AD group attempts to log in to CloudForms, they get that role assigned automatically and inherit the permissions from that role. As a result, all users in that AD group will then be assigned the CloudForms role(s) associated with that group. In Group Information, select Look Up External Authentication Groups to find a list of groups assigned to a specific user in Active Directory. In User to Look Up, enter the user name for a user in your AD group. Click Retrieve to look up details for the user in Active Directory and pull group information for the user. As a result, the AD groups will appear in the LDAP Groups for User drop-down list. From the list in LDAP Groups for User, select the group you want to associate a CloudForms role with; for example, the cloudforms group. Any user who is part of cloudforms AD group can now log in to CloudForms with their AD username and password, and they will automatically inherit the permissions for the role you assigned earlier. To confirm this is configured correctly, log in to the CloudForms user interface with a user in the cloudforms AD group. To grant an additional user access to the CloudForms server, create the user in Active Directory, then add that user to the cloudforms AD group. When that user attempts to log in to CloudForms, they will automatically inherit the correct permissions for the group. This procedure outlines how to manually configure an appliance to use SAML for federation authentication. To enable external authentication using SAML, complete the following steps to configure your HTTP server, then your CloudForms appliance. The current SAML implementation only secures the CloudForms appliance’s web user interface with SAML. The REST API and self service user interface do not currently support SAML. While other SAML identity providers can be used with CloudForms, this example procedure covers using Red Hat Single Sign-On (RH-SSO) 7.0, which is implemented using the Apache HTTP server’s mod_auth_mellon module. For more information about Red Hat Single Sign-On (RH-SSO), see the Red Hat Single Sign-On documentation. The Apache HTTP server first must be configured to work with SAML authentication. All SAML-related certificates and keys are accessed from /etc/httpd/saml2/. Other mod_auth_mellon parameters, such as endpoints and protected URLs, must not be modified as the appliance expects them to be defined as such. The mellon_create_metadata.sh script creates file names based on the appliance URL. Now that the service provider’s metadata.xml file has been generated, the service provider definition can be defined in the SAML identity provider. For Red Hat SSO, a realm can be created for one or more appliances with individual clients defined one per appliance, where the client ID is specified as the URL of the appliance. Select and import the miqsp-metadata.xml file created for mod_auth_mellon. Set the client ID as https://<miq-appliance>. Set the client protocol as saml. After configuring the HTTP server for SAML, update the CloudForms appliance so that user interface can be accessed using SAML authentication. Set the mode to External (httpd). Check Enable SAML. This enables the SAML login button on the appliance login screen, then redirects to the SAML protected page for authentication, and supports the SAML logout process. Check Enable Single Sign-On. With this option enabled, initial access to the appliance’s user interface redirects to the SAML identity provider authentication screen. Logging out from the appliance returns the user to the appliance login screen, allowing them to log in as admin unless Disable Local Login is also checked. Optional: Check Disable Local Login to disable the admin login to appliance and only allow SAML based authentication. Note that if there are issues with the identity provider or you require admin access to the appliance, you cannot log in through the appliance login screen until you re-enable local login as described in Section 4.3.3, “Re-enabling Local Login (Optional)”. Check Get User Groups from External Authentication (httpd). Ensure the user’s groups are created on the appliance and appropriate roles are assigned to those groups. See SAML Assertions in Section 4.3.2, “SAML Assertions” for more information on the parameters used by the CloudForms appliance. On your CloudForms appliance, create the equivalent groups. See Creating a User Group in General Configuration. On your CloudForms appliance, assign EVM roles to the groups. See Creating a Role in General Configuration. Complete the above steps on each appliance in the settings menu, then navigate to Configuration → Access Control. You can now log into your CloudForms appliance using your SAML credentials. To authenticate to the CloudForms appliance using SAML, the following remote user parameters are looked at by the appliance upon a successful login and redirect from the identity provider. These parameters are used by the appliance to obtain group authentication information. For Red Hat SSO, the above SAML assertions can be defined for the appliance client in Red Hat SSO as mappers. The fullName attribute was not available in the default database as of this writing and was added as a user attribute. This method requires the identity provider to be available, and the ability to log in as a user with enough administrative privileges to update CloudForms authentication settings. Log in to the appliance user interface as the administrative user. From the settings menu, select Configuration → Authentication. Use SSH to log into the appliance as root. Select Update External Authentication Options. Resolution: Verify on IPA server if you are able to log into the IPA server using same user. Resolution: The password has expired. Go to IPA/LDAP server and update your password using kinit <username>. Resolution: You should add the same group to the CloudForms group. Make sure you select Look up External Authentication Groups and enter the group name and user to look up. Make an IPA/LDAP host entry in /etc/hosts file on the CloudForms appliance. Make sure NTP synchronization exists between the CloudForms appliance and the IPA server. Check /var/log/krb5kdc.log on the IPA server end and /var/www/miq/vmdb/log/audit.log on the CloudForms appliance end for any other exception.